Lots of space. Great views. Very quiet. Short walk to the DLR station . 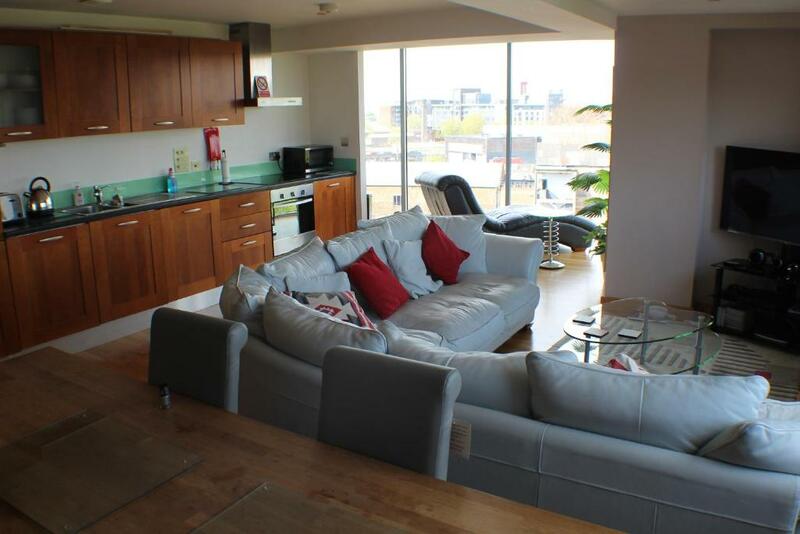 Lovely spacious apartment with great view. Very helpful hosts. The apartment was a very spacious and comfortable. Two bathrooms was super. We loved the park near by, a great walk from the underground and DLR stations. Great cimmmunication with the host - very friendly and accommodating. The apartment was comfortable, spacious and well equipped. The view was excellent and location was peacefull, there was not any noise at nighttime. Beds were good and we appreciated warm blankets since it was a bit chilly in the apartment. The owner was very accomodating, the Location suited us and was easy to get to....beds were good, apartment was spacious and well equipped, clean and quiet. Local store just around the corner was very handy and well stocked. We found it very easy and cost effective to access uber or rail to the city. Westfield shopping centre was easy to drive to and park or could have easily been walked to. The hosts are friendly, generous with advice and assistance, and make one feel most welcome. Thank you, Saff. Bow Apartment on the 4th Floor was spacious and comfortable. It is situated in a modern building which has 2 Lifts. What a pleasure with the transportation of heavy suitcases! The Security is excellent and we felt safe at all times. It was a pleasure to work in the well-equipped kitchen. The bed was most comfortable and the Bathrooms fabulous. We were most grateful for the secure free parking for our hired vehicle. 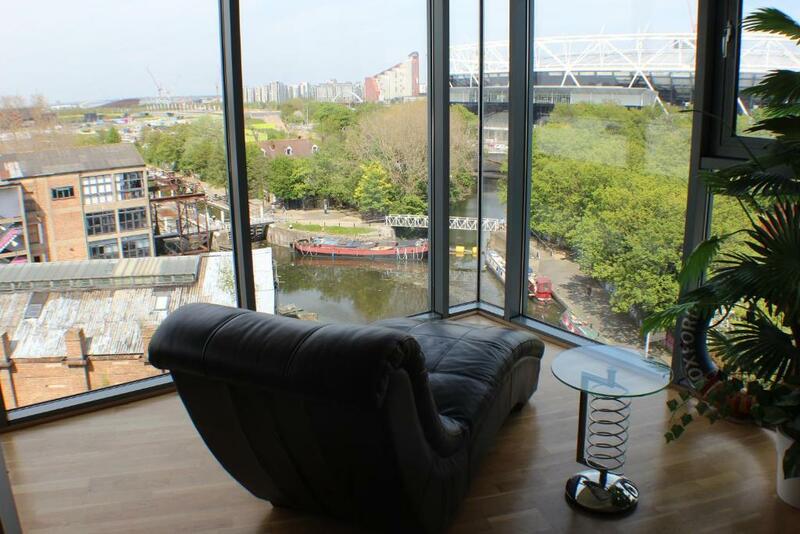 Lock in a great price for Bow Apartment – rated 9 by recent guests! Bow Apartment is located next to the London Olympic Stadium, Stratford. 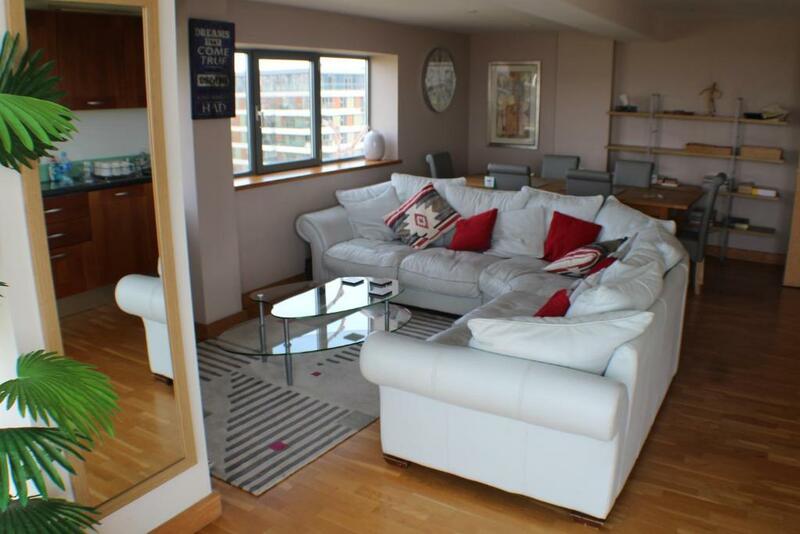 The two-bedroom apartment offers free WiFi and private parking. 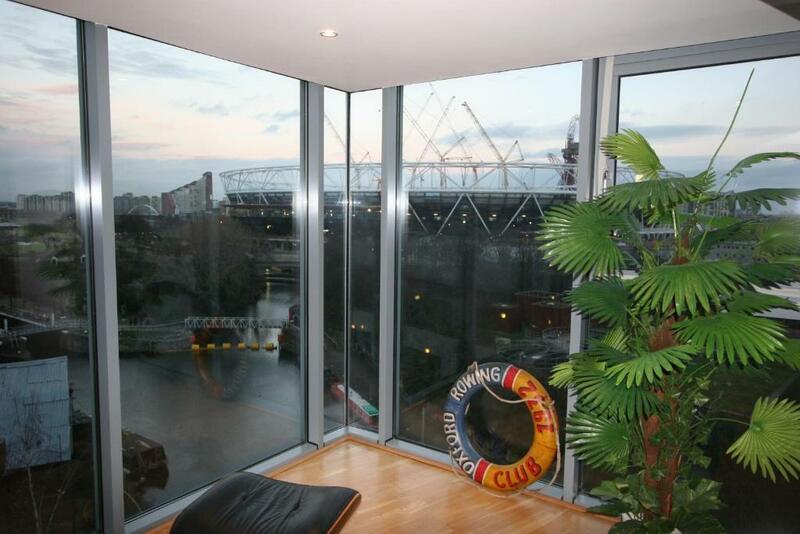 The property offers canal and city views, including those of the stadium and park. There is a balcony access from all of the bedrooms and living room. There is an open-plan lounge and fully equipped kitchen with an oven, hob, dishwasher, washing dryer and refrigerator. 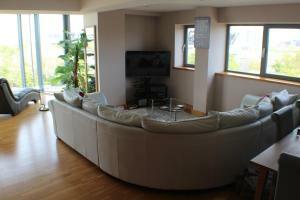 The lounge has a large corner sofa and day bed, and a dining table for 6 people. The property is a 23-minute walk to Stratford Underground Station and Westfield Stratford City. Pudding Mill Lane DLR stop is only 10 minute's walk away. 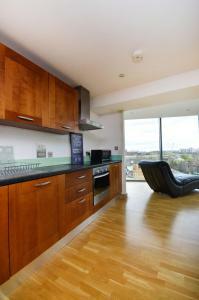 When would you like to stay at Bow Apartment? Being next to the River Lea and the Queen Elizabeth Olympic Park and Stadium (you can't get any closer), and with breath taking views, it is hard to believe that we are in London as you see boats motoring along the river and swans swimming and people fishing along the riverside. If you wanted to get to London’s famous West End, Covent Garden, Buckingham Palace, Leicester Square, Oxford Street, London Eye only 20 minutes away by tube. The Tower of London, Tower bridge are even closer as are the O2 Arena in Greenwich. 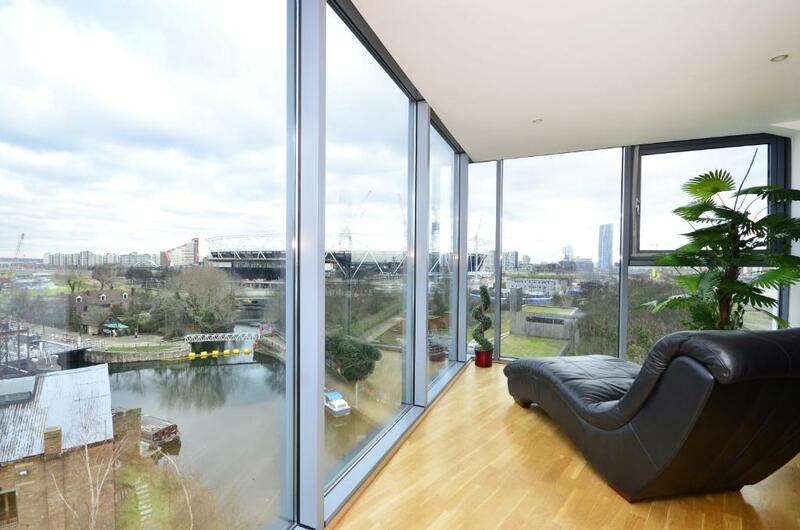 The apartment has a large open plan living room with floor to ceiling windows allowing you to see the Olympic Park and Stadium and Stratford and beyond. The apartment is in an area is known as Fish Island . Fish Island is adjacent to Bow, north-east of the City of London, south of Hackney Wick and west of Stratford. 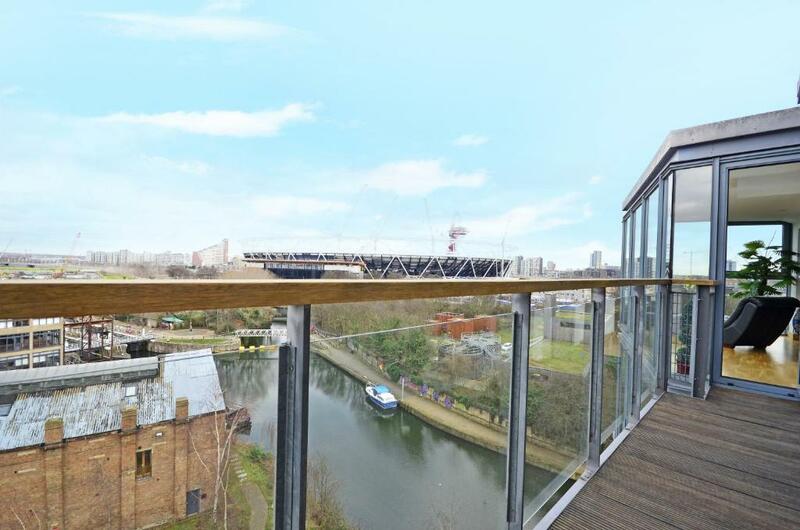 It is bounded by the River Lea Navigation, the Hertford Union Canal and the East Cross Route and is about 20 hectares or 50 acres in extent. The Fish Island area was originally known to local residents as "the Island" and later Fish Island, in reference to the roads with the names of freshwater fish: Smeed, Dace, Monier, Bream, Roach etc Fish Island has a long tradition as a home to artists and art spaces. The Island, and adjoining Hackney Wick, has 'one of the highest densities of fine artists, designers and artisans in Europe', with a 2009 study identifying around 600 artists' studios. House Rules Bow Apartment takes special requests – add in the next step! Bow Apartment accepts these cards and reserves the right to temporarily hold an amount prior to arrival. Please note that check-in after 18:00 comes at an extra charge of GBP 10 per hour. Please note that guests will receive a document from the property after booking. This document must be signed and returned to the property within 72 hours of receipt. Please inform Bow Apartment of your expected arrival time in advance. You can use the Special Requests box when booking, or contact the property directly using the contact details in your confirmation. Because of a very hot weather, the air in the apartment was pretty hot. The air condition would be very a nice feature. Too far to walk to anything (restaurants, grocery store, pubs.) Unless you are a good walker, you need a car. Or pay Uber to take you. Nice view. Comfortable furniture. Netflix. The room with single beds was a bit cold for us, also we had a problem with fitting a tall friend to any of the beds provided-but it happens to him most of the time. Fair bit of walk from the nearest tube station. Very clean and comfortable. Hosts were very welcoming. Loved our stay. Would highly recommend. Husband is 6.4 - bed could have been longer. Major bathroom was not clean when we arrived, especially the toilet was quite awfull...we also found rubbish of the previous guest in the sofa. Other premises were ok when it comes to tidyness. Air conditioning didn't function well, we needed to keep windows open a lot. Personally, it would have been nice to have a slightly bigger bed. There were fans in the flat to help with the heat of a upstairs flat. 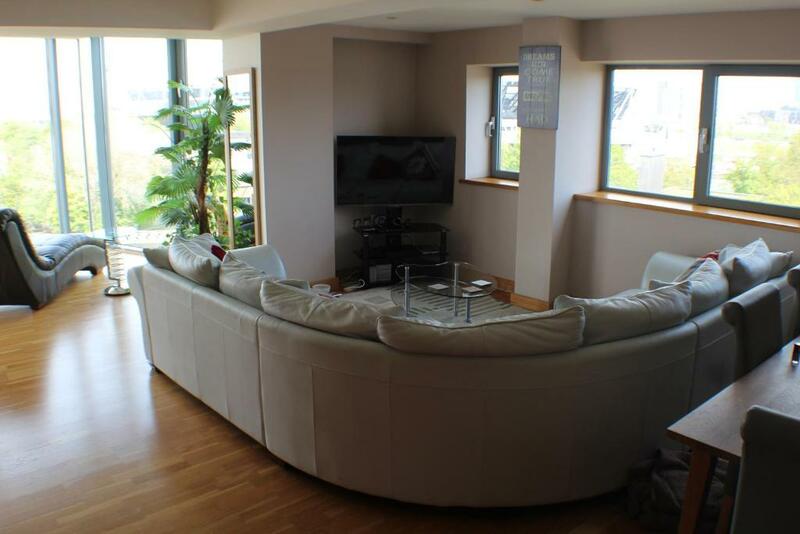 The view was fantastic in the lovely open plan living space. The route to stadium and London transport was great, especially as walking back late with kids from Athletics. Finally the place is well equipped with furniture and cleaning products to help keep it nice.